Nepalese dumplings, sheep milk ice cream, bone broth by the cup, and honey harvested from San Francisco beehives are just a few of the fresh and exciting tastes to look forward to at CUESA’s Mission Rock Farmers Market Pop-Ups at The Yard this fall. Among the 25+ farmers, food crafters, and restaurants, we’ll be featuring 12 familiar faces from our 22-year-old Ferry Plaza Farmers Market community (Eatwell Farm, Tierra Vegetables, and Dirty Girl Produce, to name a few), and welcoming 15 new vendors, including a number of innovative first-generation farmers and women-owned businesses. At our first pop-up on Sunday, September 27 (10 am to 2 pm), CUESA will also be paying tribute to the end of summer with a “Preservation Celebration.” Tomatoes, peppers, and stone fruit will have their last splash, and apples, quince, and almonds will be out in full force. Check out our pickling and preserving demos and DIY activities to make the most of this delicious summer-fall cusp. CUESA’s Mission Rock Farmers Market Pop-Ups are presented in partnership with the San Francisco Giants and Bank of America. Please join us at The Yard at Mission Rock on September 27! * Blue House Farm is a certified organic farm established in 2005 on the San Mateo coast in Pescadero. Owned and run by farmer Ryan Casey and staff, the farm grows heirloom tomatoes, sweet peppers, herbs, berries, apples, and leafy greens. Just 50 miles from San Francisco, they are proud to be so close to the people who eat their produce. *Bluma Farm is a woman-owned and -operated certified organic flower farm on one acre at the Sunol Ag Park. Started in 2014 by Joanna Letz, Bluma grows 60 varieties of flowers for people and pollinators, including Scabiosa stellata, Celosias, Ruby Silk grass, flax seed pods, Gomphrena, dahlias, and many more. Bluma will be offering mixed bouquets, or customers can put together their own. Dirty Girl Produce, a Ferry Plaza Farmers Market fixture, offers gorgeous lettuces, brassicas, beans, strawberries, and their famously flavorful dry-farmed Early Girl tomatoes, all organically grown in Santa Cruz. Eatwell Farm is another familiar face from the Ferry Plaza. 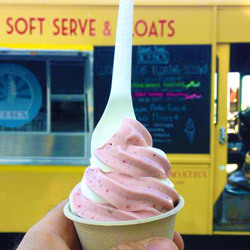 In addition to their regular assortment of organic herbs and vegetables and Drinkwell Softers (naturally fermented sodas), they’ll be offering ice cream from Eatwell Farm Ice Box, which features farm-fresh organic flavors from Eatwell and other Ferry Plaza farms. Straus Family Creamery ice cream base provides the canvas for their seasonal delights. 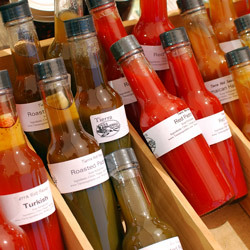 *Fruitilicious Farm produces dozens of varieties of certified organic apples, figs, quince, and citrus in Watsonville. A partnership between organic farming specialists Zea Sonnabend and Terence Welch, Fruitilicious honors the heritage of Watsonville as a historic apple growing region while nurturing the trees with contemporary and timeless organic techniques such as cover crops, foliar nutrition, pheromones, and personal attention. *Haverton Hill Creamery is a family-owned and -operated sheep dairy and farmstead creamery (founded in 2010 and 2014, respectively) in Petaluma. The Adiegos produce 100% sheep milk, award-winning sheep butter, and a signature handcrafted line of sheep milk ice cream, all made fresh on the farm in small batches. 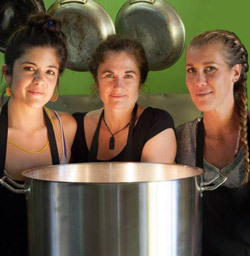 *Kitchen Witch is a woman-owned business in Santa Cruz that creates real bone broth from 100% pasture-raised beef, organic chicken, and local pork. The broth is flavorful enough to be sipped on its own for a high-nutrition drink. Kitchen Witch will be offering take-home jars of bone broth and hot broth-by-the-cup with radical flavor infusions. *Koda Farms is California’s oldest family-owned rice farm and mill, working the soil since the 1910s. Koda Farms is the exclusive breeder and grower of the heirloom Kokuho Rose rice varietal. Mark Bittman of the New York Times has called their brown rice “probably the best produced in the United States.” All rice is certified organic, certified kosher, and Non-GMO Project verified. Lagier Ranches, a long-time Ferry Plaza farmer, will be bringing certified organic dried Bing cherries, Bronx grape raisins, and cherry wood chips (for the BBQ). They will also have Loulou’s Garden jams, jellies, marmalades, and fresh bread and butter pickles, as well as freshly harvested in-shell almonds, almond meats, almond butter, and almond milk. Little Organic Farm is a certified organic dry-farm specialist, growing potatoes, tomatoes, sunchokes, and winter squash on the coast of Marin and Sonoma Counties. Farmer David Little also grows irrigated crops such as, broccoli, kales, beets, onions, leeks, cauliflower, celeriac, cabbage, kohlrabi, artichokes, and lettuce. *Root Down Farm is a perennial and pasture-based operation located in beautiful Pescadero. Dede Boies focuses on raising heritage breed animals according to the most humane standards. Root Down Farm will be offering Animal Welfare Approved whole chickens as well as livers, gizzards, heads, and feet. Chickens are fed organically and are never given hormones or antibiotics. *Oasis Date Gardens grows 13 varieties of organic dates on a 175-acre farm established in 1912 in Thermal. All dates are certified organic, and no chemicals or pesticides are used in the gardens. *Say Hay Farms is a 20-acre farm in Yolo County founded by Chris Hay in 2010. The farm specializes in raising in certified organic vegetables, melons, and eggs in an ecologically sustainable, integrated manner. 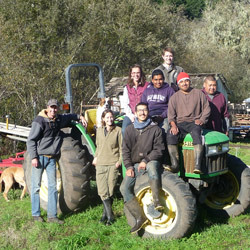 Tierra Vegetables is a family-owned and -operated farm located in the heart of Sonoma County since 1980. The Jameses grow, process, and preserve a variety of vegetables, fruits, and legumes, but at this market these Ferry Plaza veterans will be featuring their heirloom corn products (freshly milled masa, handmade tortillas, corn meals, grits, and hominy), as well as unique varieties of sweet and hot chiles, which they also preserve into hot sauces, jams, powders, and salsa mixes. Tory Farms will have flavorful grapes, plums, and pluots grown at Tory and Rebecca Torosian’s Dinuba farm (another Ferry Plaza staple). *Wild West Ferments, founded by Maggie Levinger and Luke Regalbuto in Point Reyes Station, creates a variety of vegetable ferments such as sauerkraut and kimchi, as well as probiotic tonics and wild-fermented fruit sodas. 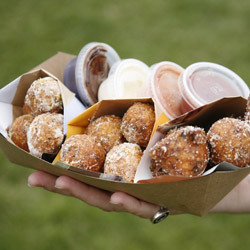 They use organic ingredients sourced from farmers in the West Marin community. Batter Bakery is a boutique bakery specializing in unique, handcrafted baked goods using premium ingredients and fresh, seasonal flavors. Baker Jen Musty will be bringing her signature cookies, breakfast items, and market cakes featuring end-of-summer and beginning-of-fall fruits and veggies. *Belcampo Meat Co. is a vertically integrated meat company including a farm, processing plant, and three Bay Area butcher shops and restaurants. On the 25,000-acre farm in Siskiyou County, Belcampo raises 13 certified organic species. All of the animals are pasture raised, and the ruminants are 100% grass-fed. Belcampo will be offering all-beef hot dogs with tons of fixings, and a variety of housemade sausages made from Ossabaw-Berkshire-cross hogs. *Bini’s Kitchen offers home-cooked Nepalese soul food. A participant in La Cocina’s incubator program, Binita Pradhan was inspired and trained by her mother in Kathmandu. 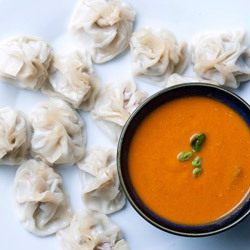 She’ll be offering turkey and vegetarian momo (dumplings) cooked with special spices and served with spicy tomato-cilantro sauce, plus mango lassis. Four Barrel Coffee offers coffee and espresso drinks using only directly sourced beans and local organic milk, almond milk, and unrefined sugar. It is a locally owned and independently operated coffee importer, roaster, and café space with three locations throughout the city. The Four Barrel crew believes in fostering ongoing relationships and direct trade with their farmers to benefit the impoverished communities of Africa, Latin America, and Indonesia. *Girl Friday Zeppole, a pop-up co-founded by DanVy Vu and Emily Nathon, serves sweet and savory Italian doughnuts (zeppole) made with flour, polenta, and ricotta cheese, freshly fried and topped with powdered sugar and lemon zest. They also offer dipping sauces such as vanilla bean crème fraîche, Earl Grey chocolate ganache, and a rotating seasonal sauce, plus a refreshing lavender lemonade. Marla Bakery sells naturally fermented and organic breads, pastries, cookies, bagels, and tarts. Everything is made from scratch at Amy Brown and Joe Wolf’s restaurant/bakery in the outer Richmond. Marla Bakery uses organic dairy, eggs, butter, and flour along with Northern California organic produce whenever possible. *Nopalito celebrates the traditional cookery of Mexico utilizing local, organic, and sustainable ingredients at their neighborhood restaurants in the lower Haight and the Sunset. They’ll be dishing up spicy totopos con chile, pork tacos on flour tortillas, tortas on housemade bread, and seasonal aguas frescas. Shorty Goldstein’s is a San Francisco Jewish delicatessen making everything from scratch using sustainable and local ingredients. They’ll be offering pastrami and corned beef sandwiches, breakfast sandwiches, gravlax bagels, potato latkes, cole slaw, and potato salad. Three Babes Bakeshop offers handmade, seasonally inspired pies, sold whole and by the slice, using ingredients from local farmers. Expect end-of-season Peach Cobbler as well as Classic Apple, Bourbon Pecan, their signature Salty Honey Walnut, and other fall pies. Bread and Butter Pickles Demo: Farmer and preserves maven Casey Havre of Lagier Ranches and Loulou’s Garden will show us how to preserve cucumbers for year-round enjoyment. Fig Conserva Demo: Chef Matthew Dolan of 25 Lusk will show us how to extend the fruits of summer by making a fig conserva. “Can You Take the Heat?” Hot Sauce Tasting: Tierra Vegetables makes some delicious hot sauces from the chile peppers they grow. Test your personal heat meter by seeing how far you can go up the Scoville scale of pepper intensity, from fruity sweet to fiery heat. DIY Pickled Peppers: Visit our DIY pickling station to learn how to make pickled peppers, perfect for tacos, sandwiches, pickle plates, and more. 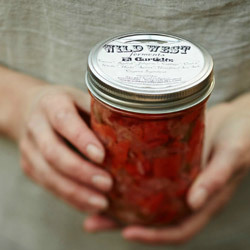 We’ll provide the peppers, brine, and jars, and show you how to do the rest ($5 per jar). CUESA’s Mission Rock Farmers Market at The Yard is presented in partnership with the San Francisco Giants and Bank of America. Save these dates for our four fall popups: “Preservation Celebration” (September 27), “Harvest Festival” (October 25), “Thanksgiving Market” (November 22), and “Holiday Hoedown” (December 20). The Yard at Mission Rock is located at the corner of 3rd St. and Terry Francois Blvd., across from AT&T Park. Join our Facebook event. Vendor photos from their respective vendors.